BJJ is getting more and more popular. The World Jiu Jitsu expo is now getting MMA fighters to do super fight against BJJ competitors. Add Jon Fitch (Guerilla Jiu Jitsu Black Belt) to the super fight schedule for the World Jiu-Jitsu Expo next month in Long Beach, Calif.
Fitch will go against BJJ world champion Paulo Miyao in a 20-minute submission only match, Renzo Gracie told Newsday on Thursday. "He's a fighter," Gracie said. "I couldn't believe when we offered him such a tough opponent, he took it right away and not even a question." 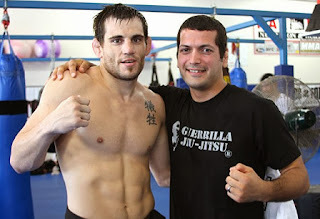 Two weeks prior to the expo, Fitch is scheduled to fight Marcelo Alfaya at World Series of Fighting 6 in Miami. Gracie also said that Rodolfo Vieira, who was supposed to fight Kron Gracie, had to pull out with an injury. A new opponent for Kron Gracie is still in the works. For more info on the expo, try worldjiujitsuexpo.com.